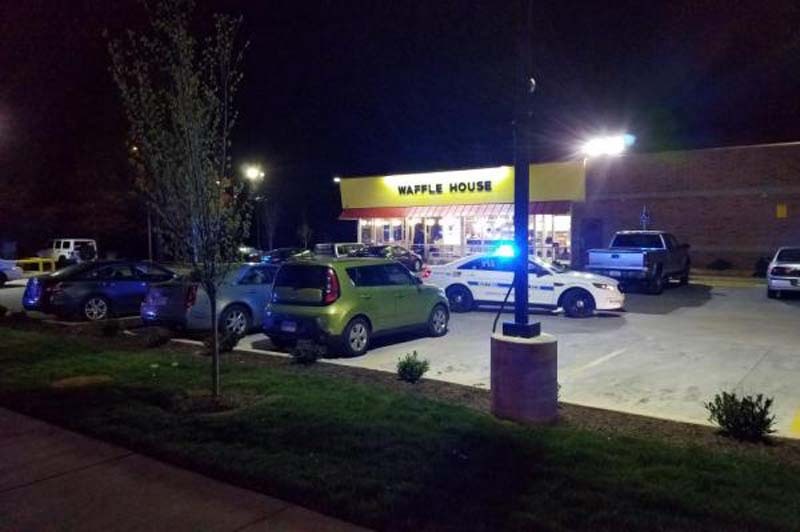 Police in Nashville, Tenn., said a man opened fire on a Waffle House restaurant Sunday morning before he fled on foot. The shooting, which killed four people and wounded two others, began at about 3:25 a.m. Sunday at a Waffle House on the 3500 block of Murfreesboro Pike, southeast of downtown, Nashville police said on Twitter. They added that the gunman was naked at the time and left the scene on foot after a restaurant patron managed to grab his gun, a rifle. Police said the gunman pulled up to the Waffle House in a vehicle registered to Travis Reinking, 29, of Morton, Ill. They've identified Reinking as a person of interest in the case and believe he was last seen near an apartment complex close to the Waffle House restaurant. At that time, he wasn't wearing a shirt, only pants.